Moving into a new apartment or house is the perfect excuse to do one thing: throw a housewarming party! Having a housewarming party means you have a chance to get all of your friends together, show them your new digs and break the place in. Never thrown a housewarming party before? Worry not. Everything from the invitations to the decorations to the party favors are covered in these 30 blog posts. All you have to decide is if you want to have an intimate gathering or a big bash! With the prevalence of Facebook and Evites, a casual housewarming bash can be as easy as sending out an invite via the internet. More formal gatherings, on the other hand, dictate a more formal invitation. These five blog entries cover everything you need to craft the perfect invitation. While you may want to wow your friends with a gourmet spread, you shouldn’t spend the entire night slaving away in the kitchen. Instead of preparing a full dinner, pass appetizers throughout the night, or arrange a potluck so the burden of feeding everyone who comes doesn’t fall squarely on your shoulders. Read the next five blog entries for some culinary inspiration. 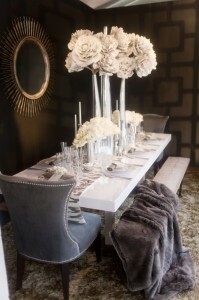 Since it’s unlikely that you want to cover your house in decorations, a simple tablescape may be all that’s needed. 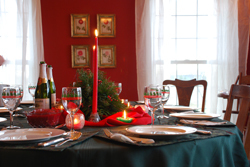 Decorate the table with a clever house-related theme, such as keys or nests, then load the table with food. 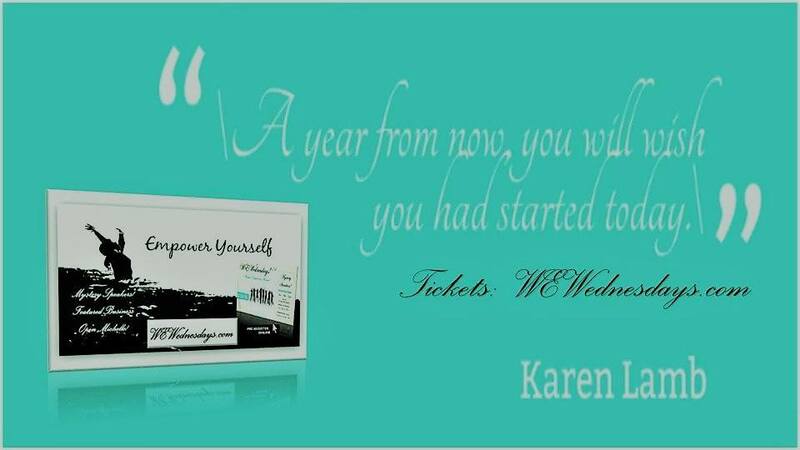 If you find yourself uncertain with how to proceed, read the following five blog entries. Inspired by Our Winter House Warming Party in Matchbook Mag! Once you’ve handled the invites, food and decorations, it’s time for the main event: the house tour. Decide ahead of time if you want to do a single tour or several small ones, then set up specific times to do so. For more ideas on how to handle house tours look at these five blog entries. You aren’t automatically excluded from having a housewarming party just because you move into an apartment. Moving into a new place, no matter what the size, is cause for celebration! If you’re apartment won’t hold very many people, you could even break it up into a couple different housewarming parties. The next five blog posts explain all the differences with an apartment housewarming party, that way you’re thoroughly prepared for whatever comes your way. While favors are not required, they are a nice touch. Baking some cookies and putting them in a cellophane bag with a ribbon on it is an easy, delicious treat you can give each of your guests. For more clever ideas for favors, read through these five blog articles. Favors are the perfect punctuation mark to the end of any party and I personally love to give edible treats because it’s economical, and the recipient doesn’t have to worry about using it or storing it. In this case I made classic shortbread cookies. I don’t know anyone who doesn’t like these melt-in-your-mouth cookies, and they hold their shape when baking so they’re just right for using themed cookie cutters. 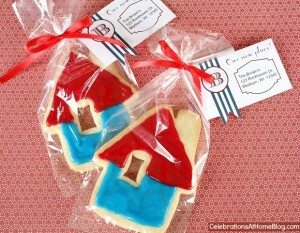 For a housewarming party, what could be more appropriate than a house shaped cookie? !